The two-for-one deal expires May 1 or while supplies last. Microsoft admitted last week that sales of its Lumia smartphones are plunging, and the company is having problems selling through its existing inventory. So Microsoft has a new strategy: It’s giving them away. 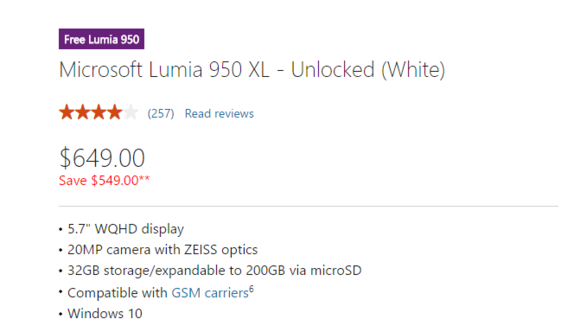 As reported by Neowin, Microsoft is now offering a buy-one, get-one free deal at the Microsoft Store: If you buy a Lumia 950XL unlocked phone for the full retail price of $649, you’ll also receive a free unlocked Lumia 950 (value: $549), according to the webpage. The deal expires on May 1, or until supplies deplete, according to Microsoft. A snapshot of Microsoft’s Lumia deal. Note that Microsoft is also giving you $150 when you trade in your Lumia 920, 925 or 1020, and will give you a free year of Office 365 Personal when you sign up for the deal. Of course, the hope is you’ll eventually become locked in as a Microsoft Office 365 subscriber, part of Microsoft’s sell-devices-to-sell-services strategy. What this means: Right now, Microsoft’s officially focusing on selling Windows devices. Presumably, it doesn’t matter if those are phones, tablets or PCs. But a two-for-one deal probably shouldn’t inspire confidence in the success of Windows phone sales in the United States. Microsoft’s Lumia line arguably appears to be in a death spiral—not helped by comments made by Microsoft’s OS chief, Terry Myerson. 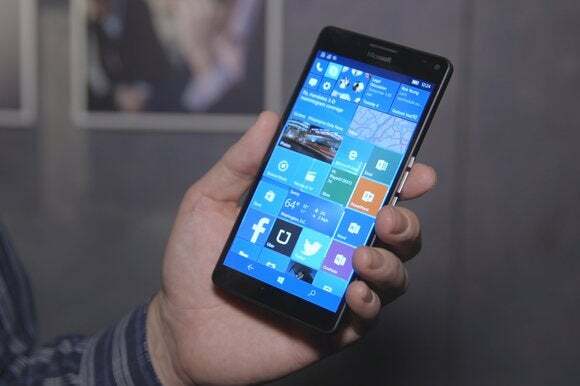 Microsoft sold a tiny 2.3 million Lumia phones last quarter, down from 8.6 million a year ago. During Microsoft's recent earning call, chief financial officer Amy Hood warned that phone revenue will only “steepen” its decline during the current quarter. Microsoft hasn’t actually stated any plans to phase out the Lumia line, but, by now, most assume that Microsoft’s consumer lineup is slowly fading. Whether that means Microsoft plans to replace it with the expected Surface Phone, though, is also unknown. In the meantime, though, Microsoft seems committed to positioning Windows phones as business tools. Microsoft’s Display Dock, for instance, complements the Lumia 950 as a way to provide a PC-like experience with just a phone and a monitor. A number of PC-centric partners, including Acer, HP, and Vaio, all have committed to selling Windows Phones. Those partners, however, haven’t necessarily committed to selling those phones to U.S. customers. On Monday, Vaio released the 5.5-inch Vaio Phone Biz, a phone priced at the equivalent of $530—but just to the Japanese market. Last week, a spokeswoman for Acer confirmed that its Liquid Jade Primo Windows phone would eventually ship to the United States, but “we do not have timing or pricing yet.” HP’s Elite x3 Windows phone, however, should ship into the U.S. market this summer.